DOC clarification on application of Barcode for Bulkdrugs/APIs dt. 25.11.2011. Pharmexcil has informed that Mumbai Customs have withheld all the API/bulk drug consignments of pharmaceutical products for non implementation of stipulations of bar coding mandated by above Public Notices. The matter has been considered in Department of Commerce and it has been decided that the mandate in the above Public Notices is applicable for finished pharma products i.e. formulations. 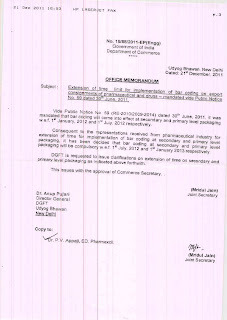 DGFT is requested to issue clarifications that above Public Notices cover only finished pharmaceutical products i.e. medicinal formulations and does not include bulk drugs/APIs/intermediates This issues with the approval of Commerce Secretary. 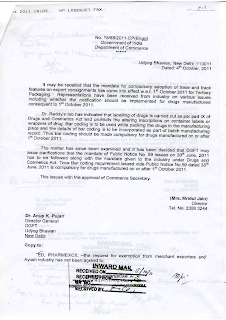 (Inner Box/carton/bottle etc) Which has to be implemented from 1st January 2012. Your immediate reply on the above would be highly appreciated and useful. At tertiary level , stickers can be pasted on the packs but at secondary level & primary level , as there are existing labeling and marking requirements from the Regulator (DCGI) , so would suggest you to please check with DCGI office if stickering is allowed and it is in line with GMP. As per GS1 standards both options online printing & stickering are OK as long as the data encoded in the barcode is conforming to GS1 standards. DGFT to indicate procedure for getting exemption u/p 3 of the notification 59. Your kind support is required to have feedback from DGFT. 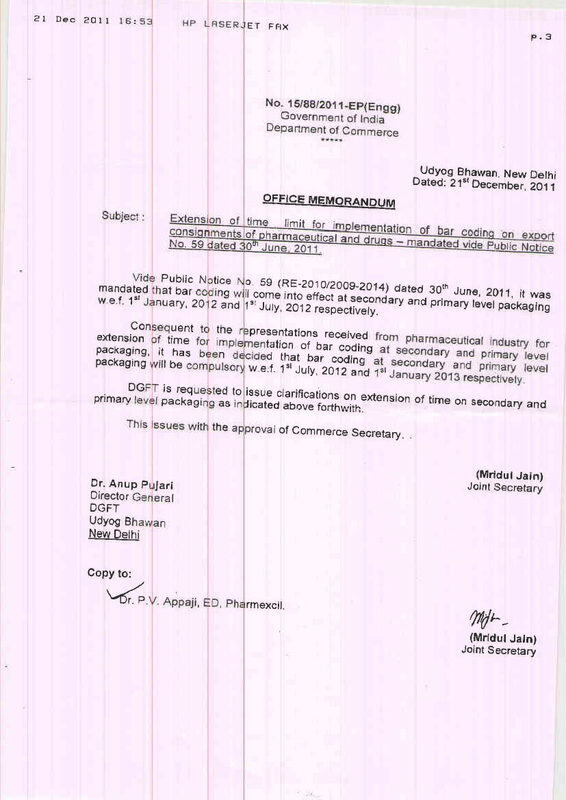 APL Query to GS1/ Pharmexcil: If importing country do not required implementation of DGFT norms. Reply from GS1/ Pharmexcil - In case importing country has regulation/requirement on barcoding then only you don’t require complying with DGFT notification and for that also you need to get approval from DGFT after showing all the required endorsements from importing country. Rest in all other case you shall be required to comply with DGFT requirements. APL Query to DGFT- What documents/ endorsement letter (from customer or importing country) require to submit to DGFT to get exceptions? APL Query to GS1/ Pharmexcil: In case, if importing country having their own EAN code on secondary pack, same can be converted into GTIN? Reply from GS1/ Pharmexcil: EAN product code is also a GTIN. If you are already using EAN/GTIN at secondary pack as per the requirement of importing country then you would require to only providing information on tertiary/shipper/logistic pack in line with the requirement stipulated by DGFT. APL Query to DGFT- In that case, only SSCC code to print on shipper label, as it is already regulated by importing country/ customer. What documents require submitting to DGFT to get exceptions? Reply from GS1/ Pharmexcil: This point is answered above in point no 1 & 2 . Myself Sunny Jain and we just had a chat on phone. I am representing Bartech Data Systems, and we provide Auto ID Solutions (Barcoding & RFID). #) Tertiary Level Packaging: The Shipper Boxes will be packed in containers having 3 to 4 locks. So, how will DGFT be able to know that the Pharmaceutical companies have followed the mandates for Tertiary Packs or not. Secondly, even at the receiving country's Dock, the officials normally don't open the containers and check the entire contents (shipper boxes), as the containers will be in lakhs. So, how the DGFT Mandates be scrutinized against the set standards? Govt. authorities, on the declaration of the consignee and also on production of labels used, they will clear the goods. As and when they got doubt, they will verify and proper action will be initiated against the offenders. It was my pleasure talking to you yesterday. Thanks a lot for solving my query. this is on the recommendation of GS1INDIA we are in front of you for some clarification. as we are exporter of food...cosmetics...and ayurvedic products...and being member of yours. will the Bar Code latest requirement from 1st oct on the master case pack is compulsory in these three category products ? can you clarify the stand on these three categories of Govt ? As per Notification no. 59 dated 30.6.2011, barcode is required for medicines for export purpose and this notification is not applicable to cosmetics, food items. 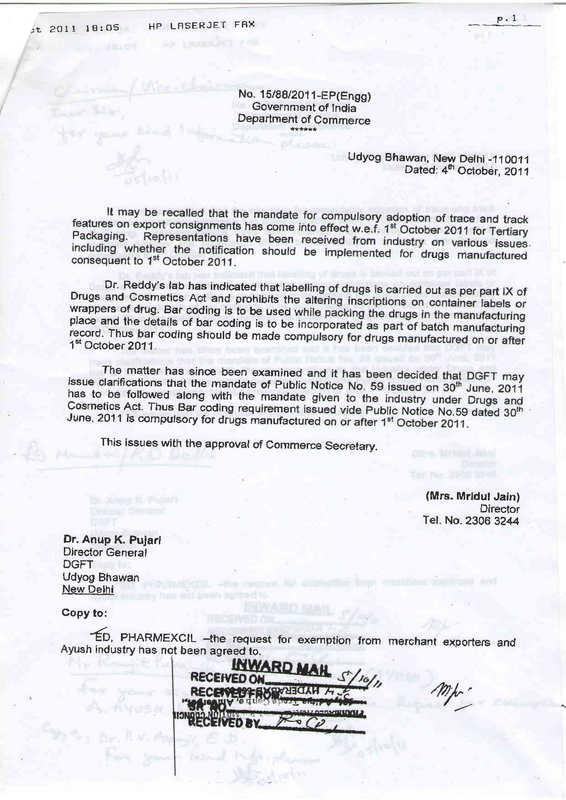 If Ayurvedic products are manufactured under Drug licence, they will be treated as Medicines and they require barcode. Please visit the website of Pharmexcil and visit the Blog maintained for this purpose for latest updates. We as Merchant Exporters would like to have clarification on some points in the Captioned matter. As you are aware, the new system proposed to be introduced from 1.10.2011 ,vide Public Notice No. 59(RE-2010)/2009-2014 is primarily applicable to Pharmaceutical manufacturers. Indeed, as Merchant Exporters, we also get certain products manufactured , through Supporting manufacturers, wherein the new system would be followed by us as well through the supporting manufacturers. However, quite often, we also buy goods from local markets (through dealers/authorized agents/ retailers/etc..). Many of those Goods DO NOT have Barcodes since the local law does not require them. It is with reference to such local packs that this letter deals. 1) Having bought such goods from traders, we / our suppliers do not have any locus standi to tamper with the pack so as to put the Barcodes. Further, there is no local rule requiring such Barcoding. 2) While exporting goods, many a times, we have to pack 8 to 10 products in one shipper since each item is of very small quantity & size so that sending them separately would mean very small shippers in big numbers. There is a threat of pilferage / Loss. So having packed multiple items in one bigger Shipper, how can one bar code that Shipper ? Batch No., Mfg. dt., Expiry date, manufacturers name & address & Mfg. Licence Nos. Further, all the Pharma consignments are checked by the office of Asst. Drug Controller both at the Air as well as Sea Ports. There ,therefore, is adequate control in place over such exports. Should you not still be convinced, we request you to grant us personal hearing. Subject: Clarification for bar coding of exports. Dear Sir, This is in relation to the notification of Bar Coding for all export medicines. We seek to clarify whether this ‘export products’ would include APIs which are exported for Pharma formulations abroad?We are not sure about the classification of products whether it means only formulations or it also includes APIs. Please suggest. Manager - Business DevelopmentFermenta Biotech Ltd 'DIL Complex', Ghodbunder Road, Thane (W) - 400 610. Maharashtra. India. I am herewith forwarding the mail received with a request to clarify whether Bar Coding is applicable to Bulk drugs or APIs . Pharmexcil is of the opinion that it is applicable to medicines which are formulations having primary, secondary and tertiary packings. We request you to give your opinion on this issue for the benefit of Council members. GSK Uday Jadhav Question: As discussed with you today, kindly refer the attached file in which we have mentioned the various packaging configuration of our representative packs. As per our understanding we have segregated the primary, secondary and tertiary level packaging which is being mentioned in the attached file. Request you to please confirm whether our understanding is correct and provide your comments & inputs on this so necessary modifications can be done accordingly. GS1 GOPAL Answered: Your understanding is correct. I require clarity on S.No 6 ( Liquid packing1) where you mentioned bottle goes in one carton, as per my understanding you are referring to monocarton , if that is so then it is absolutely right. GSK Uday Jadhav Question: Also request you to confirm whether human readable codes are required along with the barcodes on the primary, secondary and tertiary level packaging because as per the DFGT Notification (Public Notice No. 59 (RE-2010)/2009-2014 by Ministry of Commerce and Industry, GOI) dated 30th June, 2011 nowhere mentions the requirement of human readable code along with the barcode. GS1 GOPAL Answered: Human readable information is required to be printed with the barcodes at all packaging levels and same has been mentioned in the user manual (uploaded on Pharmexcil website) which is made available as a guidance document to comply with DGFT Notification. GSK Uday Jadhav Question: Further in the notification is being mentioned that the exporters of the pharmaceutical products will adopt a trace and track system and incorporate its features for exported medicines using barcode technolgogy as per GS1 global standards, however as per our understanding in trace and track system we should have association (a parent child relationship) between the primary, secondary, and tertiary level packaging hence please confirm whether our understanding is correct? if not request you to clarify the term trace and track system for the various level of packaging.